Eco Coasteering, Newquay - Coastal environmental adventure! Identify different fauna, flora and the twisting geology of Newquay’s coastal fringe on our fantastic Eco Coasteering adventure in Newquay Cornwall. You’ll get kitted out in a wetsuit, buoyancy aid and helmet before negotiating Newquay’s Gazzle route with one of our enthusiastic and highly qualified coasteering leaders. They’re passionate about the natural coastal environment around our coastlines and the wildlife, which call it home. What is the Eco Coasteer? We’ve teamed up with the Cornwall wildlife Trust to bring you the most educational and hands on coasteer through which to see the native marine habitat up close. Protecting the area whilst sustainably enjoying it is our mission at Newquay Activity Centre, and we believe that education is key to doing so! On our Eco Coasteer you’ll be guided through caves, rapids and whirlpools that provide delicate habitats for local wildlife to flourish. You’ll be Clambering over rocks and through caves, wading through rock pools, jumping into deep-water plunge pools and swimming with the marine life. 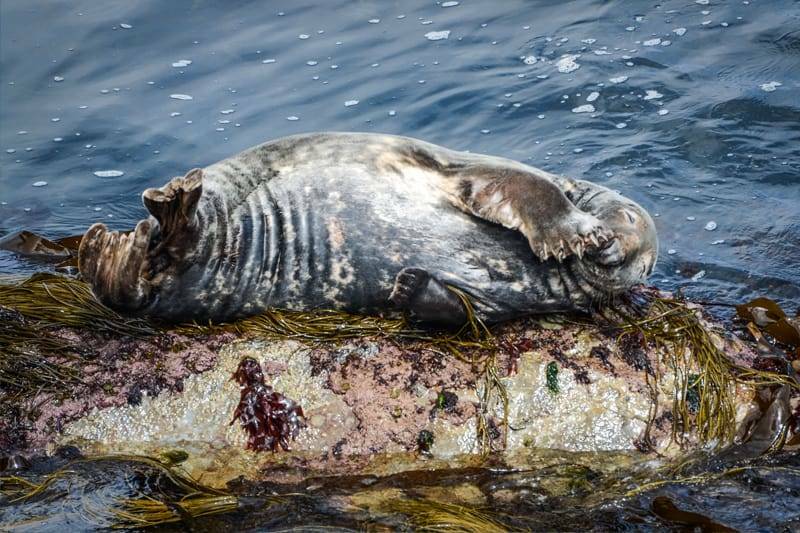 Along the way you’ll also meet inquisitive marine life including grey seals, rare Kittiwake Gulls and even dolphins. Where else can you combine so much action, adrenaline and ecology? Eco coasteering is great for school groups, families and anyone wishing to learn more about the ocean environment in Cornwall whilst participating in an exhilarating sport. You’ll discover its fragility and why conservation of our coastal areas is vital to helping preserve and protect it for years to come. You will come away with a greater understanding and respect for ocean life. You won’t be disappointed! You can also choose the intensity of your coasteer depending on your ability, experience and how much of a dare devil you’re feeling on the day. Our reviews on Tripadvisor for Coastering at the NAC rank us as number one for Cornwall activities and we’re proud golden winners of the Cornish Tourism awards. Our Eco Coasteering route is unique to Newquay activity Centre and will be an adventure to remember!